Capadia Designs: Baby Cards - use that cute paper! I went to put away the Nursery Rhymes stack (see THIS POST for details) and flipped through the papers. This one caught my eye. I never seem to use something like this for a scrapbook layout so I tend to cut up the design elements and use them for cards or page embellishments. There are only four complete images on the page. There are two partial images that will work for a card with a little imagination. For the first card I layered the baby bear on a piece of white cardstock that I embossed with the Swiss Dots Cuttlebug folder. I punched the edge with a scallop edge punch. I added a piece of pink Gemstone Core'dinations cardstock at the top right corner. 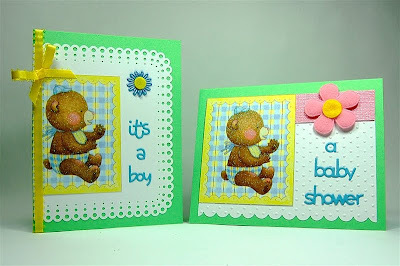 The words are cut with the Cuttlebug Combo "Welcome Baby" die and embossing set. 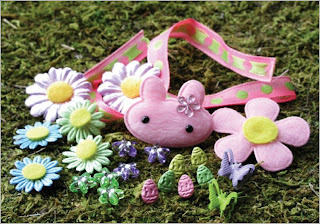 The puffy pink flower is from Creative Charms - it was part of an Easter kit that may still be available on the site. Mandy at Scrappy-Go-Lucky sent me this kit a while ago and I didn't end up using it for Easter. 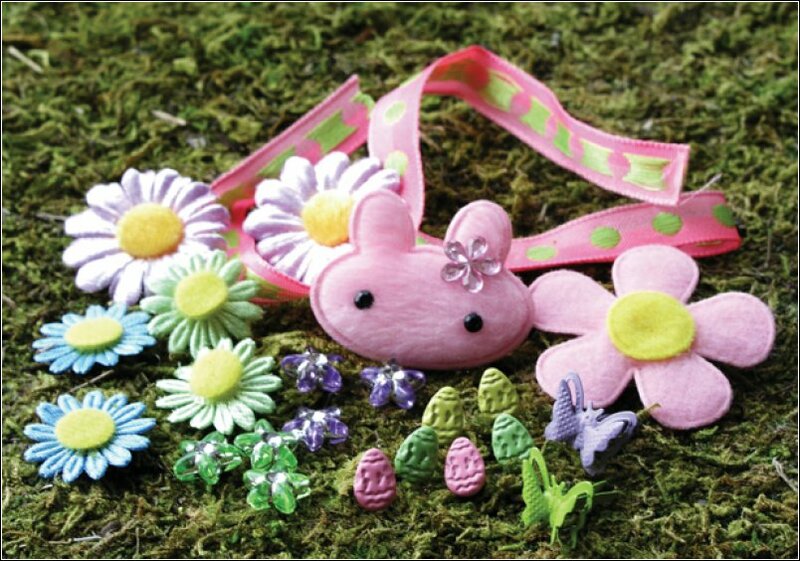 All of the items in the kit will work for many non-Easter projects (except for the six tiny decorated egg brads). If you are an Australian reader you can order this kit from Scrappy-Go-Lucky. I used one of the partial images to create this card. 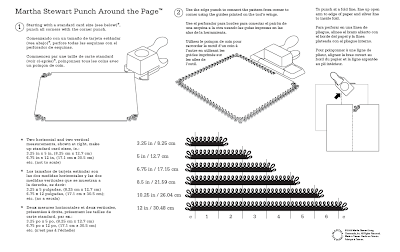 I also used one of the Martha Stewart "Punch around the Page" sets. This one is the Scallop Three Dot. These sets are fun to use but they only work out perfectly on certain sizes. Here is the sizing chart (click to make the image larger). Unfortunately, the proportions do not work for an A2 card. To get around this problem, I cut a piece of cardstock 5 inches tall from an 8 1/2 x 11 piece of cardstock. Then I punched two corners on the five inch side and the edge between the corners. 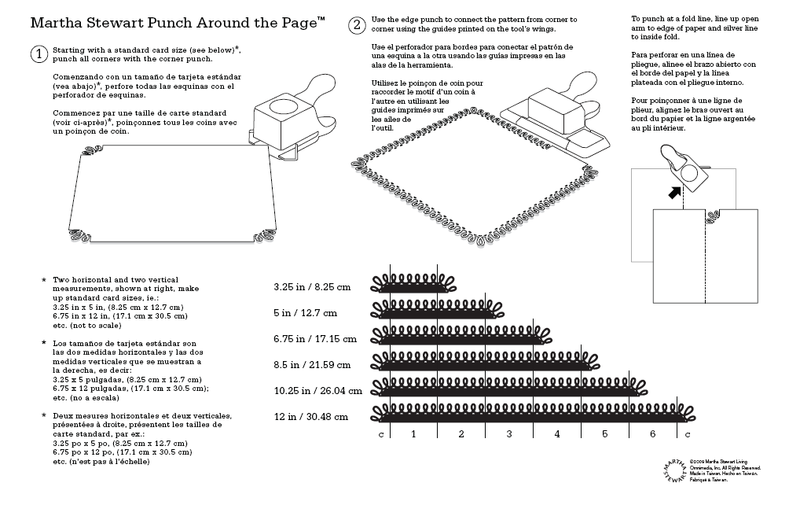 I continued the border punches along the sides repeating each punch twice. Then I trimmed the punched piece to fit flush to the left side of the card. 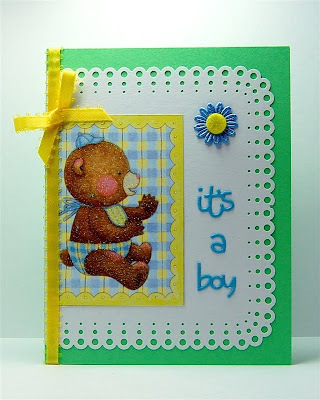 The words are cut with the Cuttlebug Combo "Welcome Baby" die and embossing set. 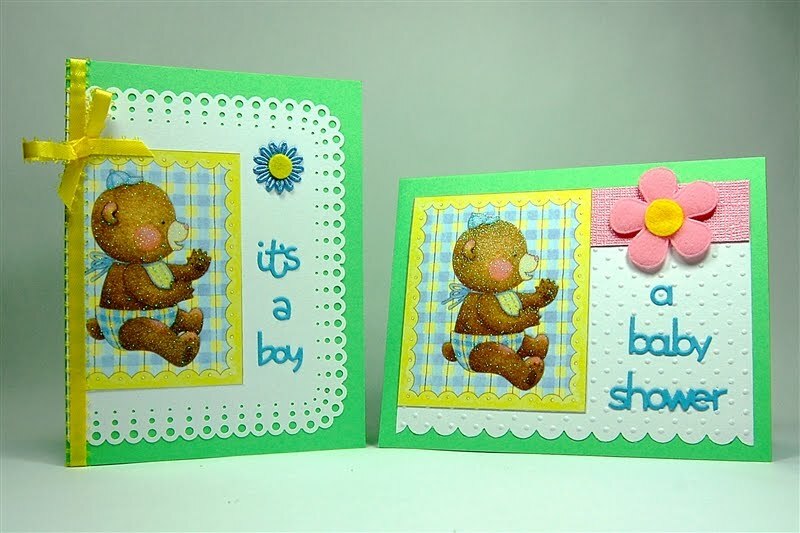 The flower is also from the Creative Charms Easter Kit. I added a yellow picot edge ribbon and bow on the left side of the card. I had fun making these cards. Now I need to finish the craft space organization! beautiful! I almost bought that stack, but thought, mmhh. Now that I see it, I should have!! Thanks! 6" square cards the 5" is too small and the 6.75" too big. Thanks for the idea about using 12 x12 designed paper for separate items. I don't use this type of page for backgrounds either, but I could use it for cards. Thanks for the ideas! Very cute cards and a great idea. Thanks for sharing. Good luck with the craft space reorganization. I need to do mine also. Baby cards produce an awwwww out of me. Love your use of the paper. So cute...need a punch around the page thingee now...always need something for these adorable layouts! I sometimes spend more time organizing than I do scrapping. Seems every thing that I buy requires major re organization. LOL! Quess that comes from having too much stuff!!! Gotta have that stuff-What fun!!! Very sweet baby cards. I need to make cards for a shower next week. Twins and I could use two of these designs. Great cards! They are so cute! 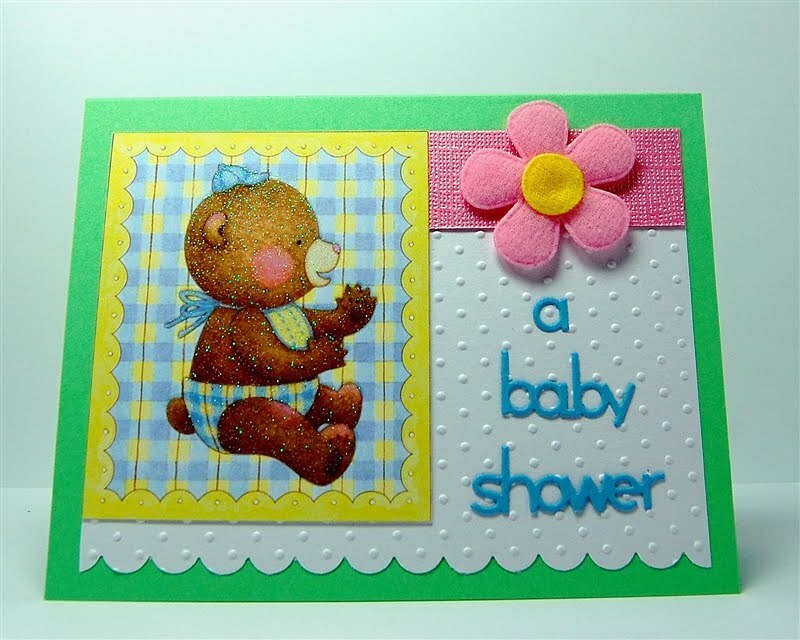 You are very creative coming up with ways to use partial designs! I can't seem to find the gemstone core'dinations cardstock anywhere - can anyone tell me where to get it? I find it at the Jo-Ann's store here in MA. We have only a small store and they still carry quite a bit - the superstore near my Dad has even more colors to choose from. I haven't seen it at the other large craft stores around here. 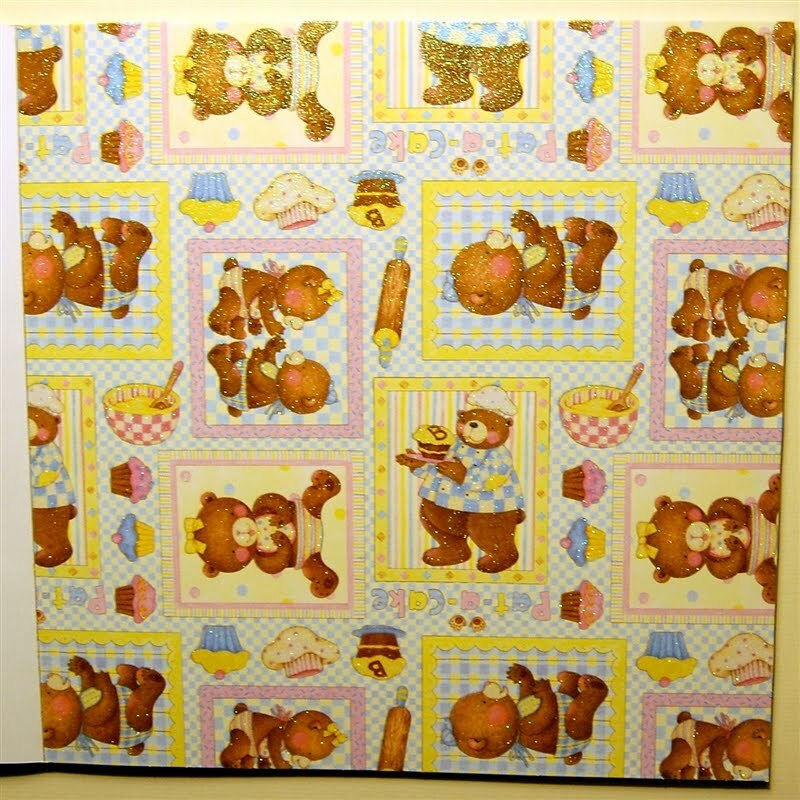 Do you think a local scrapbook store near you might carry it? What a great way to use what might otherwise be a "busy" piece of paper! 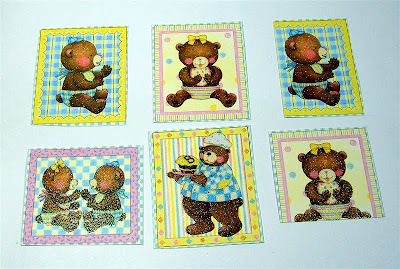 Very cute cards. I have one of these Martha punch sets and have yet to be able to get it to work out right. Just can't seem to get the hang of it, guess I have to be patient and keep trying.